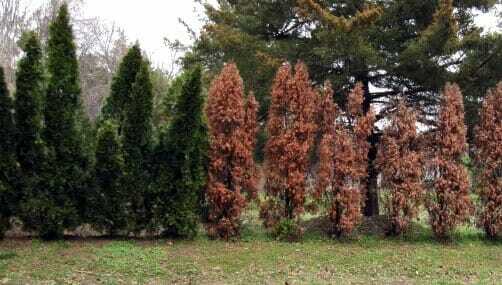 Leyland Cypress trees and similar like Thuja Green Giant trees can provide great privacy but have huge issues when it comes to offering privacy long term. Disease, drought, and natural disasters are the leading causes of damage to these trees. In many cases, you’ll have a few of them die which will create gaps in your screen rendering it almost useless. To fix the gap you will have to install more of them which could then damage the others around it. These have very large root balls so replacing one of them will likely damage the others in the process. Prone to disease which threatens the life of the plant. Resistant to pests and disease, while problems are rare it does not typically affect plant health. Prone to drought damage or death. All bamboo is drought resistant and holds water very well. Will up-root in natural disasters and are difficult to revive. Even in the worst of disasters broken canes will always be replaced by the next spring’s growth. Expensive to replace. Bamboo will replenish damaged canes during the next spring growth cycle. Seiridium Canker, Botryosphaeria Canker, and Cercospora Needle Blight are all common diseases that can affect foliage, stems, and branches. These are the common diseases that will cause branches or the whole tree to turn brown. There are also some root diseases such as Phytophthora root rot caused by Phytophthora cinnamomi, and Annosus root rot caused by Heterobasidion annosum. These diseases spread quickly from tree to tree and can eventually kill off your whole privacy screen. Possibly the most common reason for these cypress trees dying is drought. Unlike disease, a drought will quickly destroy your entire planting. With some of the recent record-breaking droughts across the USA, it’s safer to stick to plants with more tolerance for drought. Just look at our facebook post with a picture taken after 54 days without rain. The drought we had last year in Alabama greatly affected cypress trees around our area. A large majority of them showing partial foliar damage, or completely dead. Bamboo is resistant to disease, drought, and natural disaster. In just under 40 years of growing bamboo, we have never encountered any serious problems with any of these issues. As much of bamboos “life” system is underground, any damage above ground can be quickly replaced with the next springs new shoots. Eliminating costly maintenance and loss of your privacy screen. Bamboo is an amazing plant that grows quicker than any other species and provides a lush, evergreen screen for you to enjoy. We love bamboo and hope you choose it as a feature in your landscape. We have over 150 species growing at our nursery and can choose the right kind for you. What are you waiting for? See what bamboo plants we have for you. We have recently started incorporating bamboo into some of our landscaping projects. Just like your article says, it is disease and drought resistant. It also adds an interesting visual aspect to the design. Leylands may lose their lower as they grow taller if they have been planted closely together. The trees strain to provide water and nutrients to the upper foliage which get the most sunlight, and thin out or drop their lower limbs if they have a lack of water ans nutrients relative to their increasing size. Generally they can only stay full if their height is no more than 4 times the width between the trees (so for example if they are 5′ apart, they can only be about 20′ high and still remain full). One option to top them off and shorten them. If there are neighboring trees shading them, you could trim those to provide more light. You might also need to provide them more water. You might also consider evergreen shrubs to fill in the lower parts of the hedge, if you can give both them and the cypress trees enough room, light, and water. The problem with bamboo is control. I need a screen along the back of my property to keep from seeing the new subdivision being built. In between us, and the subdivision is a strip under high power lines. Bamboo Shield can be used to control bamboo. If height is a concern, bamboo can be trimmed to any desired height, and only needs to be trimmed once per year. I planted 6ft leylands last year as a privacy screen in ortley beach NJ. This spring I noticed some browning on the lower branches. The soil is rather sandy but I planted them with generous amount of mulch and soil. I think they were I jur d by severe winter winds. One had a lot in one are st the top! I have Leyland Cypress Trees at home and they are beautiful when we first planted it but now it’s really browning. Now I have to ask men to work for it to be removed in our yard because it’s not pleasant to see. Bamboo is undoubtedly an amazing plant with many favorable points. However, it is native to Asia, not North America. To the best of my knowledge, it provides no benefit to wildlife in terms of food, and has been known to elude intended barriers to its spread and overwhelm native species of grasses, shrubs, and trees that could provide food and habitat for native wildlife. I believe these deficiencies should be pointed out to your potential customers so they can make informed decisions about plantings on their property. There are 4 bamboo species native to North America. Bamboo provides an abundance of shoots which are commonly consumed by wildlife. Bamboo foliage is comprised of up to 22% protein and stays evergreen. This provides grazing wildlife food year round.